The laboratories and centers within the College of Engineering bring together forward-thinking minds and great entrepreneurial spirits. Dreams of startup companies and innovative technologies are often born in these collaborative spaces, and sometimes they even become reality. Although they serve very different purposes, WebFilings and Mechdyne, two Iowa companies, share many commonalities in their histories—starting with their ISU origins. Marty Vanderploeg, former associate professor in mechanical engineering, his business colleague Matthew Rizai, and former Iowa State students Jeff Trom and Dan Murray founded WebFilings in 2008 along with Jerry Behar and Joe Howell. Soon after, Mike Sellberg, an engineering mechanics and biomedical engineering alumnus, joined them. The company has grown rapidly since its inception, boasting more than 60 percent of Fortune 500 companies as clients. Also born at Iowa State, the company now known as Mechdyne Corporation started as a consulting project and evolved into a bolstering partnership with VRAC. Chris Clover, Mechdyne’s CEO, founded the company as a graduate student with Jim Gruening, Kurt Hoffmeister and Mike Hancock—all Iowa State alumni. Bright and innovative engineers like these alumni save people time, energy and assets as technology develops a larger role in the global economy. When these minds come together to form partnerships, the opportunities are endless. Mechdyne started as a series of small consulting projects while Clover, Gruening and Hoffmeister were in graduate school. 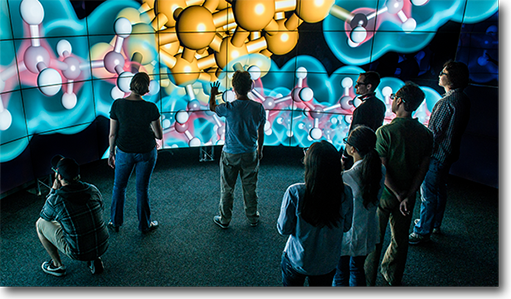 The immersive visualization environment called the C2 was developed in VRAC at that time, and soon after its completion, entities outside Iowa State became interested. Mechdyne’s CAVE2™ offers a cylindrical 320-degree collaborative space with 480 feet of viewing surface. When the Naval Research Lab in Washington, D.C., wanted similar visualization technology, Bernard suggested Clover, Gruening, Hoffmeister and Hancock for the job. Clover—who earned his bachelor’s and master’s degrees in aerospace engineering and later his Ph.D. in mechanical engineering from Iowa State—says they went to D.C. and built the immersive cave system for the navy, marking the beginning of Mechdyne. 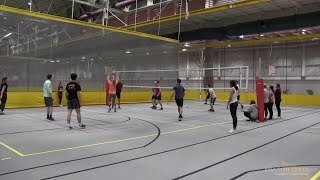 The group set up headquarters in Marshalltown, Iowa, because it needed a large space to build and test equipment, and Clover’s father, a semi-retired entrepreneur, rented the team space at a good price. “The cost of doing business here is very competitive, and the people we can recruit are top-notch,” Clover says. The small-town location hasn’t hindered business, either. Now a leading provider of innovative visual information technologies, Mechdyne serves a global market, including government labs and U.S. armed forces. The company provides customized solutions in consulting, software, technical services and hardware integration. Before the founders even had time to think about going international, they took on a project in Taiwan. The team had to learn about currencies and shipping equipment halfway around the world without any international experience. Clover called it another learning experience, but a very successful one. At that point, the group found a good deal of business opportunity outside the U.S. 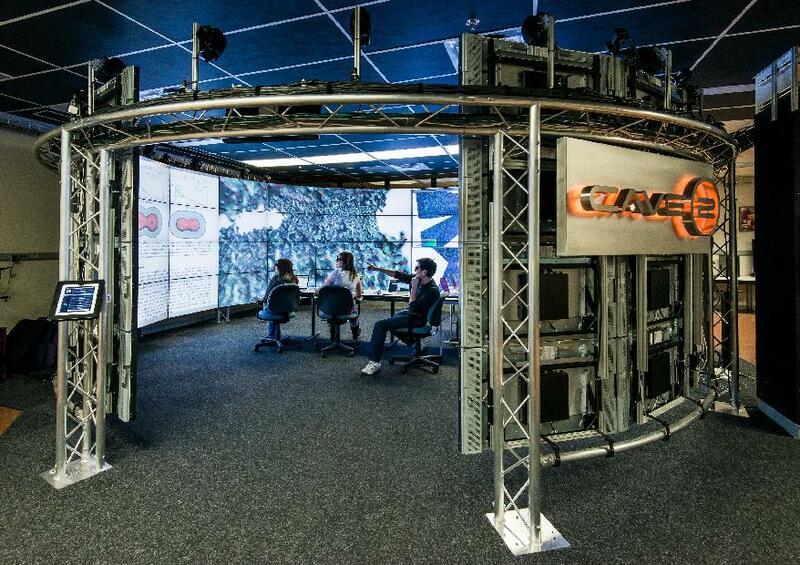 The CAVE2™ has scalable-resolution display walls and a second-generation virtual reality system, a revolutionary technology that supports information-rich analysis. Often traveling internationally to meet with customers, Clover has been to nearly 40 countries, and although he likes to experience new cultures, he doesn’t forget his roots back in Ames. “We still have a lot of friends at Iowa State, working with the folks at VRAC, like Jim Oliver, Eliot Winer and Glen Galvin,” Clover says. Oliver has known Clover, Hoffmeister and Gruening since they were students in his classes. VRAC still maintains the synergetic environment that once brought Mechdyne’s founders together. 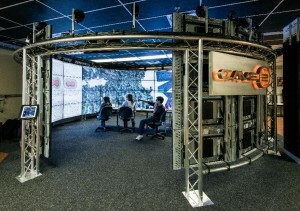 The company even installed the C6 at Iowa State, which is currently the top visualization system in the world. 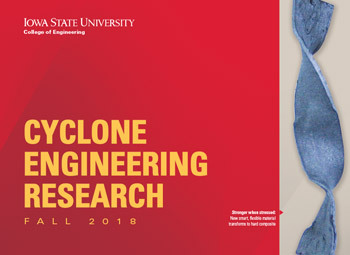 Clover says Mechdyne works closely with the university in keeping up with new technologies, and the C6 has been good for both Mechdyne and Iowa State by attracting graduate students, researchers and professors. Before WebFilings was created, part of the same group of entrepreneurs founded Engineering Animation Incorporated (EAI) in 1990. Many of them met at Iowa State’s VRAC, which was founded that same year, in part, by Jim Bernard. The four founders of EAI—Vanderploeg, Bernard, Trom and the late Jay Shannan—were highly involved in the emerging research at VRAC. Rizai became the CEO of EAI in 1990, and soon the company was in full force. Based on their ISU relationships, Sellberg and Murray joined EAI in 1992 as software engineers. 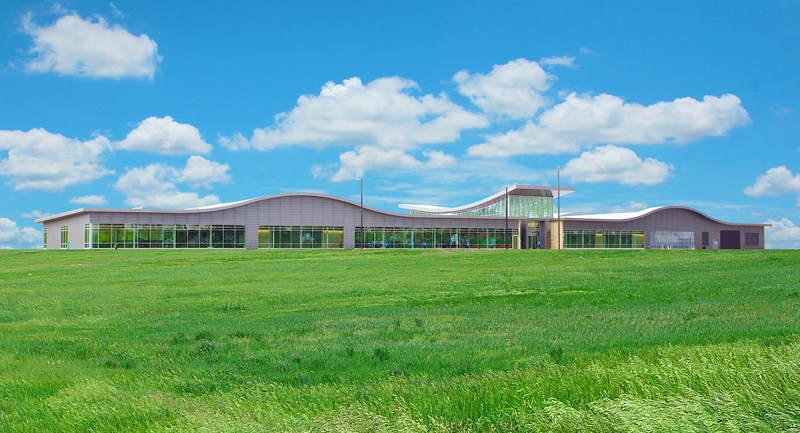 The WebFilings Headquarters is located in the ISU Research Park in Ames. EAI became a premier software visualization company for the manufacturing, engineering, automotive, aviation, and heavy equipment industries with more than 20,000 customers. 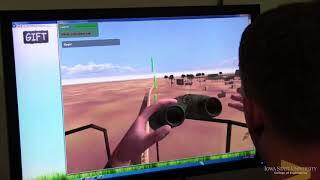 It developed and released the first commercially viable 3D interactive visualization software package and created EAI Interactive, which grew to be the largest independent game developer in the U.S. at the time. EAI’s medical and scientific illustration team also developed 3D interactive educational products. EAI went public in 1996 and grew to 21 offices worldwide, with more than 1,200 employees. It was recognized as one of “America’s Fastest Growing Companies” by Individual Investor magazine before it was acquired by Unigraphics Solutions in 2000. The entrepreneurs say EAI was a stepping stone of great proportions. Founded in 2008 as a cloud-based, Software-as-a-Service (SaaS) firm, WebFilings set out to solve complex business data reporting challenges in a new way. The SaaS model is delivered as a service through the Internet and written to serve thousands of customers simultaneously. In 2010, WebFilings modernized the way companies report to the U.S. Security Exchange Commission (SEC). Soon customers wanted more, and the company extended the collaboration capabilities of its solution into other areas of reporting. The WebFilings platform—known as Wdesk—is a business reporting platform in the cloud that powers external and internal reporting, risk reporting, funds reporting, board reporting, and corporate social responsibility reporting. Massive amounts of complex business data stay connected through the platform, reducing errors and saving time and money. WebFilings is still growing rapidly, with headquarters in the ISU Research Park and offices in 11 other U.S. cities and in Amsterdam, Sao Paulo, London and two Canadian cities. In the midst of their success, both companies—and those who helped lay the foundations for them—continue to boast close ties with the university they say helped foster them. Since both companies have leaders connected to Iowa State and headquarters nearby, Mechdyne and WebFilings often look at the university as a pool of potential employees and interns. 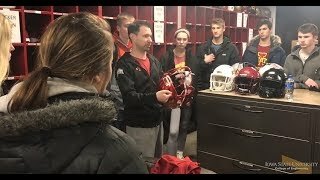 “We try to recruit as many Iowa State engineers as we can, so we’ve got a number of folks from the university working here,” says Clover. Similarly, Clover remembers the opportunities he was given at the university. Bernard, who currently serves as a WebFilings consultant, says companies like WebFilings and Mechdyne are helpful to Iowa’s economy.